This is a simple little piece that I am hoping that I will get people to join. 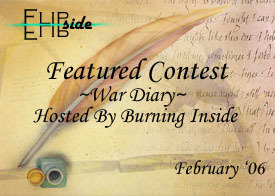 The point is to write a diary about being in a war. You can have it be any war that you want, an old war, or a war that is in the future. Be in the war, or a bystander, it is your call. No graphic content, I know it is about a war, but it is just a diary, you need not describe how someone dies, even if someone dies. Deadline is whenever he can find a computer to use. 1 - [Kuzco] May take me a while but I'm in! 2 - [Mister Saint] Waah! 5 - [La Divina] Chizzness! Another contest thingy I enter! 6 - [RiverStar] Got a great idea...now all I need is 48 hour days to actually write it....hmmm....anyone invited a machine to go back in time yet? 2006-02-08 [chuchutrain]: O.O he slept?! 2006-02-17 [chuchutrain]: My News: I updated my entry and I'm not sure if Burning will be able to get to a computer in time for the deadline...so maybe expect him to be late. But that's in my opinion and I haven't talked to him about deadlines for his contests...so yeah. 2006-02-18 [Burning Inside]: yea i probably wouldn't be here on time for this so it is getting knocked back till the last weekend of Feb.
2006-03-04 [La Divina]: Hey, when do we know who wins? 2006-03-05 [chuchutrain]: When he can find a computer to use...his is down and it's taking forever. 2006-03-05 [Kuzco]: well these are good news, I won! :P great theme Burn, was really fun and interesting to do. 2006-03-05 [chuchutrain]: yay! :D:D third place! congrats Kuzco and Kaimee!! 2006-03-16 [Kuzco]: awesome chu, thanks for the trouble.